Instagram users love to shop. At least that’s what Instagram tell us, and we’re inclined to agree! 130 million users are tapping to view product details each month, so it comes as no surprise that the social media platform have decided to enhance the shopping experience further. 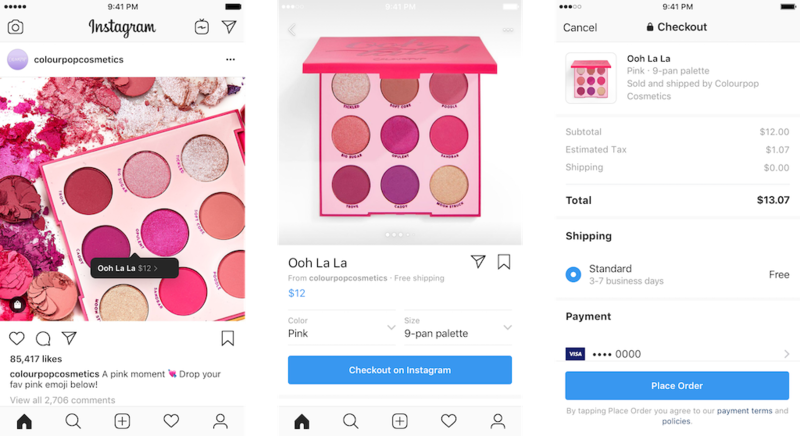 Last week Instagram announced the launch of its newest feature, Checkout on Instagram, allowing users to shop directly through the app for the first time. Just the same as Instagram Shopping, users will need to have an approved business profile and their product catalogue linked via Facebook to be able to use Checkout on Instagram. When users tap on a photo to view the product tag, they’ll see a ‘Checkout on Instagram’ button. Shoppers will then simply select their size / colour / etc in the app, enter their payment details and delivery info, and place their order. These details will then be securely saved, making the next purchase even quicker! Previously, shoppers would be taken to the retailer’s website via pop-up window, resulting in a not-so-user-friendly experience, and many abandoned shopping carts. Checkout on Instagram is currently only available in the US and being rolled out by a limited number of brands such as H&M, Nike, Zara and Burberry. However, US-based brands are currently able to register their interest for the service. It seems that the shopping experience won’t stop here either. Instagram have described checkout as “just one part of our long-term investment in shopping” and that they are “excited to introduce even more ways for people to enjoy shopping on Instagram this year.” We can’t wait to see what’s in store. From a brand perspective, this looks to be pretty exciting. Many of our clients are already using Instagram’s shopping tags, with social being a main driver of sales, so we can’t wait to see the impact that this could have! Fingers crossed we won’t have to wait too long for it to be available in the UK. From a personal perspective… this new feature could prove dangerous for our bank balances here at South Coast Social. We’ll keep you posted!